atouvap.fr • Consulter le sujet - LES BONS PLANS de HEAVENGIFTS en DECEMBRE ! Hey guys, new product time again. This time we will introduce you a new kit from Eleaf, called ASTER RT with MELO RT 22, which is a perfect combo of Aster RT mod and the MELO RT 22 atomizer. The innovatively designed “Recessed Tank” style compact mod- Aster RT, can hold and hide at most 22mm diameter tanks. Featuring 100w maximum power output, it comes with a battery capacity of 4400mAh, which definitely ensures you a prominently long time vaping without any worries. Benefiting from the preheat function, you can heat up the coil at a higher wattage in a very short time. It also supports upgradeable firmware, custom logo and different interfaces for you to check the total puffs and vaping seconds. With 3.5ml e-juice capacity, MELO RT 22 features the creative “Retractable Top” solution, providing you the easiest and most convenient refilling experience. Due to the 22mm diameter, it perfectly matches with the ASTER RT. In addition, the tank can be easily detached and reassembled, resolving many cleaning problems. It comes with the new ER 0.3ohm head consisting of single SS316 coil, which is compatible with VW, Bypass, Smart, TC-SS and TCR modes. Introduce you the new Avocado RTDA-Avocado 22 Special Edition by Geekvape. Genesis style tanks are known for its good flavor. The original Avocado tank has been receiving good comments since its release. As requested by many vapers, Geekvape redesigned the original one into special edition with two major improvements. Geekvape has made the deck and post holes larger to fit wider variety of coil builds, available for dual or single coil with ceramic block off, added side juice fill port for better access. It comes with 3 new premium matte finish color options. If you happen to look for an RDTA tank, the special edition Avocado definitely is a good choice. Use our special Christmas coupon code "XMAS30" to enjoy a 30% off huge discount! Now is approaching the end of 2016, it seems at the end of each year,the industry always brings us something new, in 2014 we have the sub vaping culture, in 2015 temperature control tech emerges, what about 2016? Well, Joyetech introduces its Ocular series mod. It might be a sign of a new vaping trend! A full color display touchscreen makes your vaping simple while it keeps a physical fire button to proof a life long quality. What's more, Joyetech brings a music player inside of the mod, it means you could enjoy your vaping moment while listening loveable songs. A photo gallery function is also introduced into Ocular. Imagine this, while your vaping, life photos remind happy, sad moments you lived. How lovely that is! Ocular could be a nice helper for your gym time. It has a built-in pedometer! Other then these, Ocular features VW, VT, Bypass, TCR, Preheat functions that all advanced vapourizers should have. 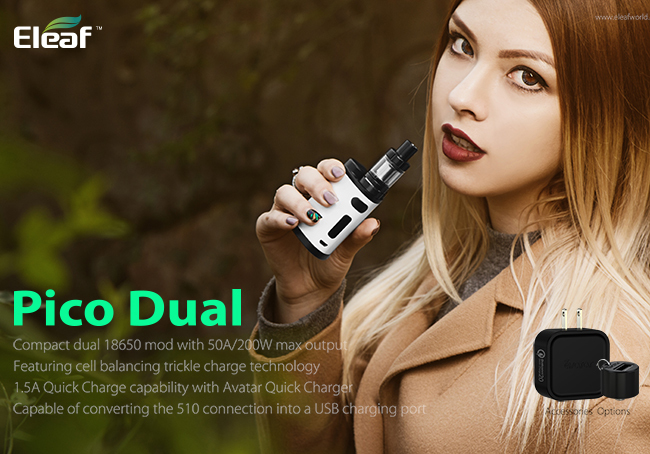 Joyetech gives vapers 2 options, a 80w Ocular features built-in cells, light-weighted, a 150w Ocular C features 2 interchangeable 18650 batteries for those who enjoy cloud chasing, high wattage vaping. Such an innovative device, what do you waiting for? Time to grab in hand! Use"AHG10" coupon code to get an extra 10% off discount. Introduce you an phenomenal level TC mod- Woody Vapes X200. The X200 is a one integrates performance and aesthetics. X200 is equipped with the powerful USA Gene chip, supports to temper contol Ni/Ti/SS coil. It only takes you 30 second to fully heat the coil. Vape never goes so fast! The maximum output power reaches 200w, powered by dual 18650 batteries. X200 is made of aluminum alloy and stablized wood. The adoption of aluminum alloy material gives the mod a solid and light-weighted body. The stablized wood side pannel delivers a luxury and personalized feeling, as you might already know, each stablized wood is in different color. Plus its TCR adjustable function, Woody Vapes X200 could bring you a lot of vaping joy! Use our special Christmas coupon code "XMAS30" to enjoy a 30% off discount! Hey vape fellows, we are so exciting to introduce the newly designed product of JayBo from Wismec, namely REUX. It's a nice looking and durable atomizer made of stainless steel. With 6ml huge tank capacity and top filling, it ensures longer vaping time and easy e-juice refill. This REUX also features a detachable structure, which brings great convenience in cleaning and maintenance. The highlight of this tank is it is compatible with multiple coil heads. In the simple package, it contains a pre-installed RX Triple 0.15ohm coil that offers massive vapor clouds and a RX Ceramic 0.5ohm coil for pure flavor. While in the luxury package, you will get an extra 1ohm Clapton coil and a RX RTA Deck 1. Apart from that, Wismec also provide several optional coil heads including RX dual 0.15ohm coil, RX RTA Deck 2, RX RTA Deck 3 to meet different users' preference. Featuring a 25mm diameter, it will give your enough room for coil building. And the large air slot at the bottom is easy to adjust and brings massive airflow. No matter you are a pre-built coil lover or a coil builder, this REUX tank will definitely cover both of your needs. Now you can use our 30% off Christmas special code "XMAS30" to get it at the best price. Extra!Extra! Eleaf just released a flagship level kit-Eleaf Pico Dual. The pico Dual is equipped with the latest technologies. It might lead a new trend in the coming 2017.Aesthetically, it keeps the previous pico design, still remains in a compact size but increase its output power which could reach to 50A/200W. What's more, it is newly add a cell balancing trickle charge. This new technology helps you to protect your batteries from unbalanced charge and prolong lifetime. Well, most of you might suffer the pain a compact mod does not last long. Eleaf this time well solved this problem with a quick charge technology introduced. The mod can bear a 1.5 amp load charging rate with the help of an innovative chip and Avatar qucik charge. Besides, it is capable of converting the 510 connection into a USB charging port. How fantastic it is! A mod can be a portable power bank. We dare to say, if you were looking for a new Kit, Eleaf Pico Dual is the one you cannot miss, the one worth your trying! Use our Christmas special coupon code "XMAS30" to get an 30% off discount! Generally, the more powerful the mod is, the more batteries it requires, which thus making its finished size larger. But now, Smok break the rule with its newly released GX350, which is a compact and super powerful mod. It features a beautiful appearance with ergonomically body design and the strongest output power with a surprisingly compact size. The GX350 mod can fire up to 350W when powered by 4 x 18650 batteries or up to 220W when powered by 2 x 18650 batteries. And it also support TC function, various protection features and upgradeable firmware. Smok match this GX350 mod with its classic TFV8 tank, which will be a perfect combo for producing massive vapor clouds. If you love high power device but don't want a "big buddy", you can't go wrong with this Smok GX350. Now you can enjoy 30% off with our Christmas special code "XMAS30" for this new device. 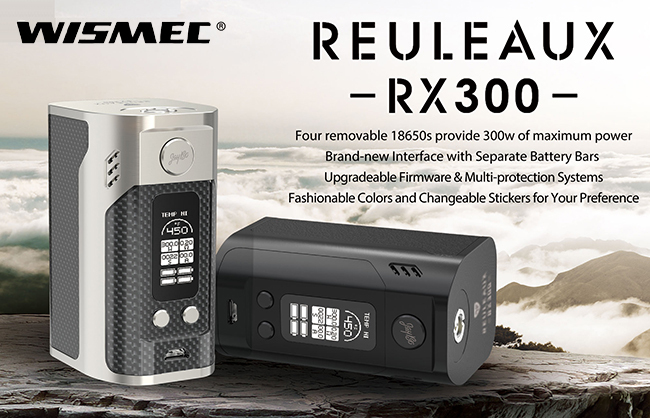 The renowned Reuleaux Mod series all begins with the original Reuleaux DNA200. 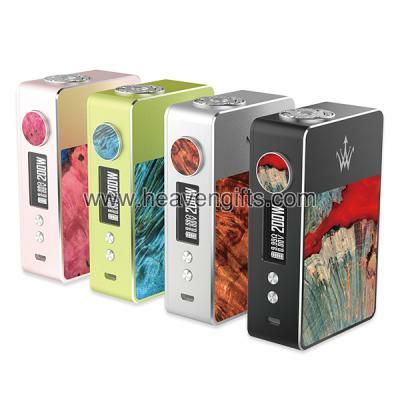 It was the first 200w TC mod, equipped with DNA chip. It was the first mod adopts the Reuleaux style which delivers a great grip feeling. Now Wismec joint with Heaven Gifts releases a limited edition-Bronze. For those who are impressive with the performance of DNA chip, those who are still hesitated to grab a high wattage mod, the Bronze edition is worth to be purchased as an unique version among Reuleaux Mod family. Use our Christmas special coupon code "XMAS30"to enjoy a 30% off discount! Illusion tank is designed for high power vaping. And most amazing is it's totally leak-proof as Geekvape claims. It can hold 4.5ml of e-liquid and a top fill system with a large fill port for easily adding juice. The bottom adjustable airflow ensures air travel upwards to coil via two large slots of this tank. In addition, both a wide open delrin drip tip and a 510 drip tip available for your preference. Overall, this Geekvape Illusion looks like a strong competitor to the popular TFV8 with its stunning performances on both flavor and vapor production. Please feel free to use our Christmas special code "XMAS30" for a huge 30% off discount.